The Sew Knit Create Shop: Like the Madewell Songbird Dress? Wanna make your own? 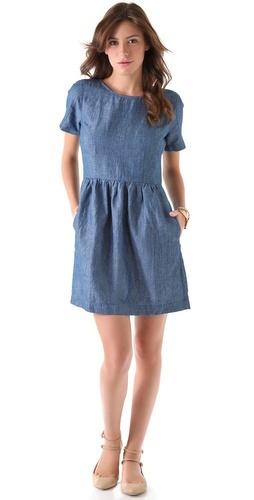 Like the Madewell Songbird Dress? Wanna make your own? The Madewell "Songbird" dress is one of the brands most iconic styles and lucky for us girls who sew the classic style is super easy to replicate with minimal effort. First grab yourself a copy of Colette Patterns Peony dress. This style is nearly identical to the Songbird. The Peony features a bateau neckline rather than the round but this is easily altered should you wish ( if anyone would like me to do a tutorial please just ask!). You can also alter the skirt to make it fuller if you wish, again this is a simple alteration. Put aside the skirt pattern piece and cut 2 rectangles both 2x waist measurement wide x desired length. Mark where you want your pockets to be ( you can use the pocket pattern piece from the peony dress) and attach as outlined in the peony instructions. Stitch 3 rows of basting stitches along top of skirt piece, gather to fit bodice. stitch skirt front and back together as outlined in peony pattern and voila you have your fuller skirt. This dress is best made up in a mid weight cotton or wool. A chambray would look gorgeous and I love The striped version worn by Busy Phillips (pic below).